Researchers printed transistors on a smooth, clear piece of nanopaper. An innovation in nanoscale technology, and an interview with co-author Liangbing Hu (Department of Materials Science and Engineering, University of Maryland Energy Research Center, and the Maryland NanoCenter), was the focus of an article recently published in the American Chemical Society’s news magazine. “To make paper-based circuits that can perform calculations or control displays, researchers need to find a way to print transistors. Unfortunately, previous paper transistors perform poorly because the surface of regular paper is bumpy and uneven…In addition to its rough surface, regular paper’s other limitation is its opaqueness. 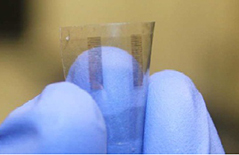 To produce electronics for transparent displays, researchers need a transparent material, like plastic or glass. “Liangbing Hu, a materials scientist at the University of Maryland, College Park, turned to a smooth and transparent kind of paper called nanopaper. Instead of the micrometer-sized cellulose fibers found in regular paper, sheets of this material contain nanoscale fibers that produce an even surface and allow light to pass through. Other authors included John Cumings, (MSE, NanoCenter); Jia Huang, (MSE, Center for Nanophysics and Advanced Materials); Colin Preston (MSE) and Kathleen Rohrbach, an undergraduate student. The research was first published in the journal ACSNano.